With only one candidate facing any competition, the entire CSYou team was victorious this year in the Concordia Student Union elections. Of the nearly 36,000 undergraduates attending Concordia, only four per cent, or 1,428 people, actually voted. In comparison, voting tallies by The Link estimate that roughly 1,500 students cast their ballot last year—and that was amid the student strike. “With all but one position running unopposed, there was less interest because people thought it was less important to vote,” explained CSU Chief Electoral Officer André-Marcil Baril. Voting at the Loyola campus continued to be an issue, with less than 19 per cent of all votes coming from the campus. But the numbers also show there higher to voter turnout levels in some student demographics. While the Fine Arts Faculty had no candidates running for CSU council or Concordia Senate, the faculty itself had the highest proportional voter turnout. The elections also saw changes to CSU bylaws I and J carried. Bylaw I, which outlines the structure for collecting fees from students, was amended to be superseded by Bylaw J, which created a fund committee to oversee funds collected for student space and other special projects. A fee levy increase of $0.10 per-credit for Sustainable Concordia was carried with an overwhelming majority, as was the creation of a $0.12 per-credit fee levy for Concordia Greenhouse. The referendum question for the Concordia Food Coalition, worded “Would you like to see the CSU actively support the new affordable, sustainable, student-run food services initiatives on campus?” also passed by a huge margin. 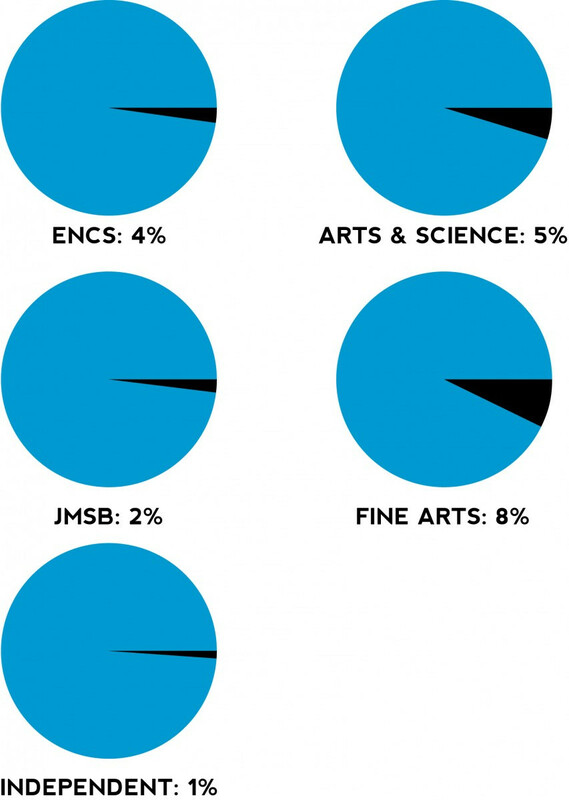 Despite being the smallest faculty, fine arts students were, statistically, the most interested in this year’s elections. “Maybe that means in the future, more people will be more interested in coming out and actually representing that department, or more activities from the CSU can be geared towards them,” said Baril. At 8 per cent of their faculty showing up at the polls, they had the highest proportional voter turnout—double that of Engineering and Computer Science, which consists of only marginally more students. 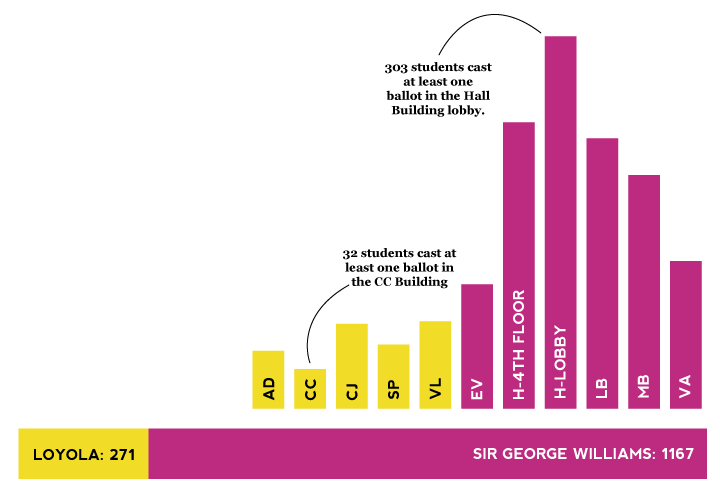 But even with the highest proportional voter turnout, fine arts students will see no representation on council—a fate similar to this year, when a string of resignations in the fall semester left the CSU with no sitting fine arts reps.
Five of 11 polling stations were positioned around Loyola, yet voter turnout on the campus only accounted for 271 votes, or about 19 per cent, of ballots cast. According to incoming VP Loyola Crystal Harrison, member associations see a livelier turnout. “Our MA elections were higher than they have ever been, we actually ran out of ballots because so many people voted,” she said. As to why CSU elections aren’t catching on, Harrison said it’s a mystery to her. “They just don’t care about anything other than [MA elections] apparently, and it’s frustrating because I literally saw people go and vote [in the MA elections], then not turn around and vote in the other one,” she said. A previous version of this article misspelled the name of JMSB councillor Aaisha Malik. The Link regrets the error.